Whips, guns, woman and costumes � Indiana Jones has it all and it plays well too! 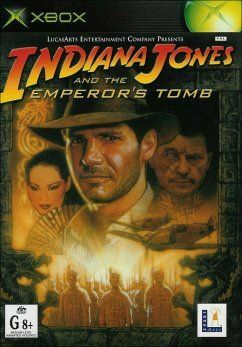 I have to admit to finding Indiana Jones games in the past slightly lackluster and disappointing. So on receiving this game I had huge doubts. However as soon as the intro hit the screen, I knew I was in for an exciting ride. In this episode of Indiana Jones you travel to 1935 China to prevent a powerful artifact from finding it�s way into the wrong hands. The game flows through many countries of the globe, which allows for some eye-candy scenes. 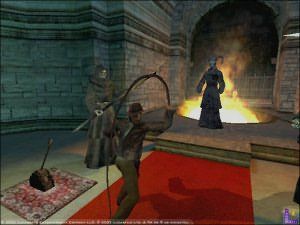 The game follows the path of the storyline very closely, however still allows an amazing array of gameplay options usually forgotten about in a game of this nature. This game involves an original storyline that has not been seen in any of the Indiana flicks. There is also a vast array of enemies from seducing mistresses to frightful enormous crocodiles. The atmosphere in the game is also terrific. It has been a while since a game has been able to fill me with anxiety to the extent that Indiana Jones does. 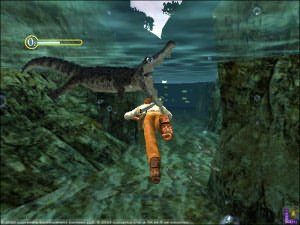 In one scene you have to throw a distraction for a crocodile and swim across a gap before it gets back. As you are swimming the music starts beating and the croc comes into view. As the croc gets closer and closer all forms of obscenities escape your mouth � absolute brilliance. The controls in the game become extremely efficient after some adaptation time. As you approach a low ledge there is no need to push the jump button as the character climbs up them automatically. When you do push jump in these situations however the character does not go onto the ledge. I found this to be one downside of the game. Weapons and equipment are easily sorted through via the Directional Pad. By pushing the Left Trigger the game swaps into first person. The game is normally played in third person. Shooting, jumping and actions are all completed using the X-Y-A-B buttons. When Indiana Jones loses health, which is often, finding a water fountain and drinking from it can build it up again. Indiana also carries a canteen, which can be filled up at the fountains and be drawn upon later to replenish lost health. Indiana Jones also carries a wide range of utensils and weapons, which vary from level to level. Items ranging from machetes and whips through to guns and table legs. 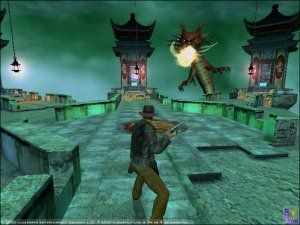 The worlds in Indiana Jones are completely interactive, and are not only great on the eyes but also brilliantly designed to keep the player flowing through the story. Indiana Jones can smash chairs and tables and even ornaments. After smashing them he can then pick up parts of them and fight with them. Nothing beats smashing a poacher with a shovel. Indiana Jones and the implementation of his whip amazed me for hours. Indiana throws out his whip and attaches to objects such as an animal head, and swings to an opposite ledge. He can also throw his whip in mid jump allowing the distance he can cover in the air becoming enormous. The whip can also be used in fights to disarm enemies. To understand completely the joy of this whip, the game must be played. The fight scenes in Indiana Jones are full on and highly interactive. Often a tussle will be decided by who manages to get to a gun on the ground the quickest. Weapons can be dislodged from enemy hands by whipping them or through fighting them. After that, it is a mad rush to get a hold of it. Sometimes the fight scenes are all guns or all hand to hand, both are intense and usually a struggle. The initiative of the AI to pick up weapons off the ground in the middle of a fight is brilliant and adds to overall realism of the game. There is no multi-player component to this game, but it is difficult to see how it could have fitted in with such a story-based game. Saving the game was also a bit of a downer, as you had to reach a certain point to save. Although the points are quite close and fountains are placed in clever positions it is still a pain. The game is also quite difficult even on the easy setting, which makes for a good challenge. The sound quality is consistent with the rest of the game and when characters talk they are easily interpreted. The Indiana Jones music is implemented often, but fits in well with the game so it is not a distraction. The sound also has a huge impact on the atmosphere of the game with the momentum of the music changing with events in the game. The graphics in the game are equal to the highest quality that I have seen so far on the Xbox. The scenes are sensationally textured and the characters fluent and life like, not just in texture but also in animation. Indiana�s vast amounts of moves are implemented seamlessly with each other to make the game beautiful to watch. Indiana Jones is a brilliant gaming experience and I would recommend it to anyone. I urge you not to be hesitant just because it is Indiana Jones, as the game that is there to be played is brilliant. As you can probably tell by the way this is written I am extremely impressed by the initiative shown by the developers in creating a unique gaming experience, which is highly rewarding.